A judge decided Friday that the Strafford County Community Corrections Bail Program should not be forced to accept Jazzmyn Rood. Eve Tarmey, left, died on Oct. 17 of a Fentanyl overdose at a Rochester, New Hampshire, motel. Her mother, Jazzmyn Rood, top right, and Mark Ross have been charged in connection with Tarmey's death. 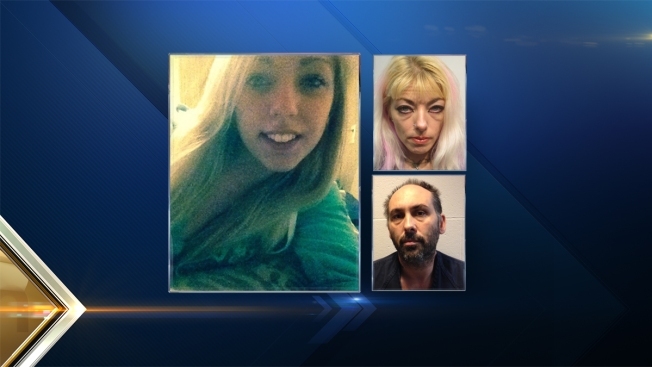 A judge's ruling will keep a 41-year-old New Hampshire mother charged in the October fentanyl overdose death of her 17-year-old daughter behind bars. Foster's Daily Democrat reports a judge decided Friday that the Strafford County Community Corrections Bail Program should not be forced to accept Jazzmyn Rood. Prosecutors say Rood wasn't accepted into the program because she is considered to be a high security risk given that federal charges might still be brought against her. Community Corrections officials also believed Rood "would not do well out in the community." A Dec. 16 ruling in Stafford County Superior Court allowed for Rood's $10,000 cash bail to be converted to personal recognizance if the program accepted her. Instead, Rood's bail will remain at $10,000 and she will continue to be held.